How hungry are you? Measuring out a portion of dry pasta can be a challenging task since the cooked amount never seems to match up with your expectations. 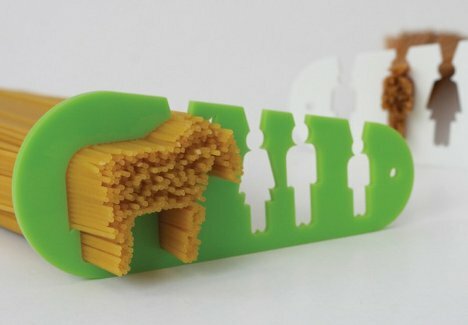 This handy little device from designer Stefán Pétur Sólveigarson helps you measure out just the right amount of spaghetti for a child, an adult, or someone who is hungry enough to eat a whole horse. Each cutout in the measuring device’s service is meant to both visually and practically define the appropriate serving size for each member of the family. The “horse” portion is meant to measure out enough pasta for an entire family, although we can see it feeding one super-hungry adult. 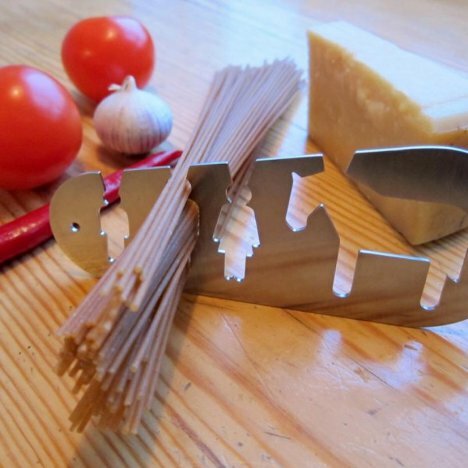 The adorable device is available in both plastic and stainless steel varieties so you’ll never have to guess on pasta portions again. See more in Home & Personal or under Gadgets. December, 2011.